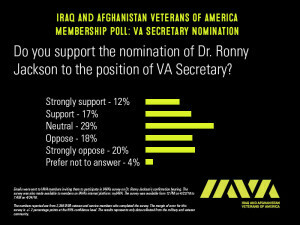 As reports speculate that the Senate will postpone the scheduled Wednesday confirmation hearing for President Trump’s nominee for VA Secretary Dr. Ronny Jackson, Iraq and Afghanistan Veterans of America (IAVA), the leading voice of the Post-9/11 generation of veterans, revealed results to an exclusive poll on veteran support for the new nominee. 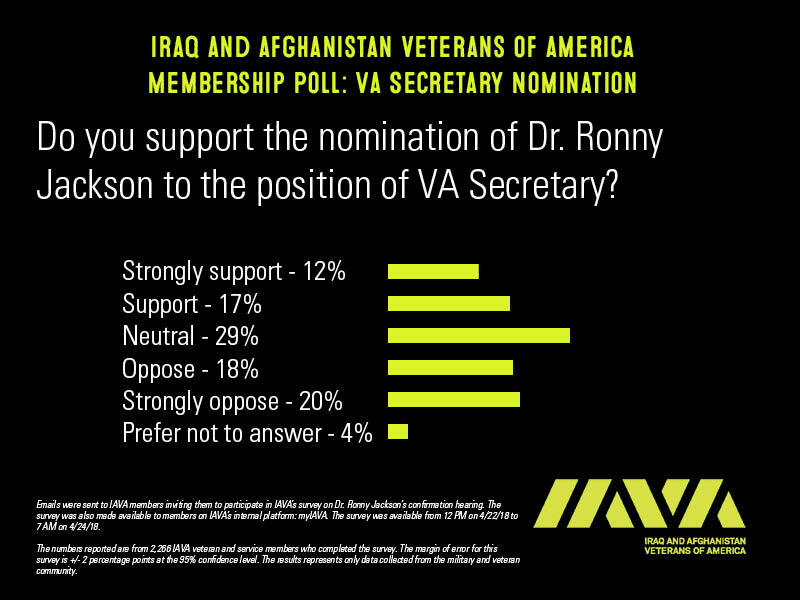 The poll, conducted over a two-day period and surveying more than 2,266 IAVA veterans and servicemembers, found that the majority of veterans do not support Dr. Jackson’s nomination, and 38% oppose him for the critical position. 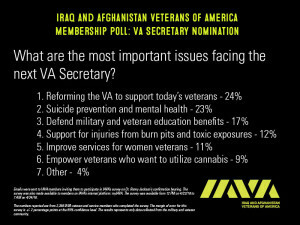 The VA Secretary is one of the single most important voices in America for all veterans. 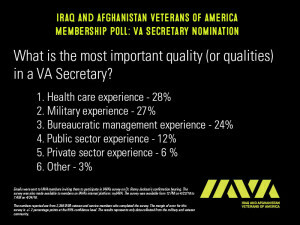 It is critically important that the person leading the VA understands and is prepared to handle the responsibilities and the challenges that go along with the job. IAVA members nationwide are calling on the Senate to do its job at this defining time and ensure that any nominee for VA Secretary will live up to this awesome responsibility. 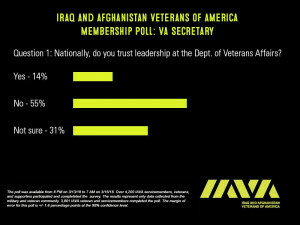 Without stability in VA leadership, veterans nationwide are being left behind, our priorities are stalled and our national security is jeopardized,” continued Rieckhoff. On the evening of Wednesday, March 28, the Secretary of Veterans Affairs, Dr. David Shulkin was fired by President Trump. 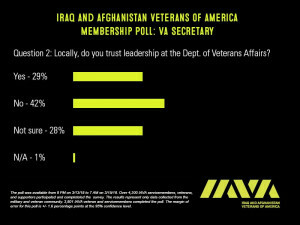 Just days before the announcement that Dr. Shulkin had been fired, IAVA polled our members on their feelings towards VA leadership, and the results showed that veterans were not happy with the performance from those in power at VA. See the full results of the poll here. 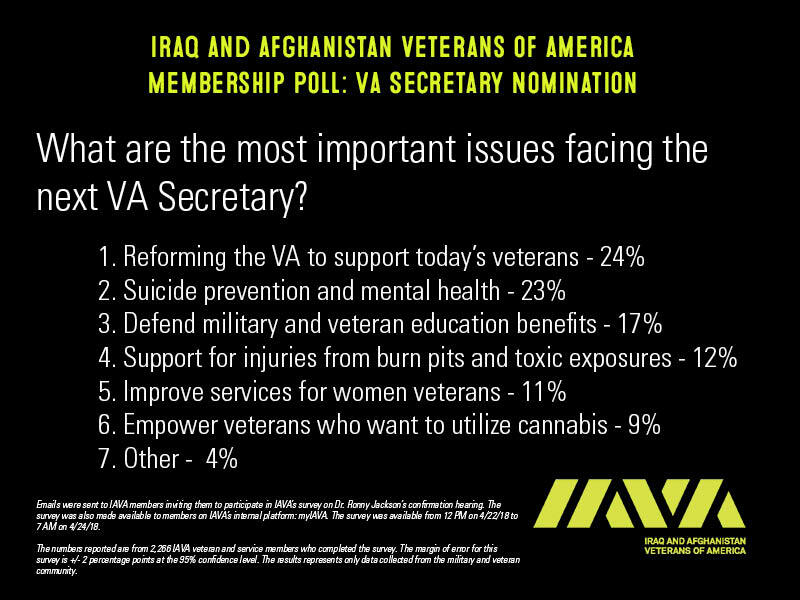 To join fight for VA reform and to learn more about how you can help support IAVA’s Big 6 initiatives, visit our Take Action page by clicking here.